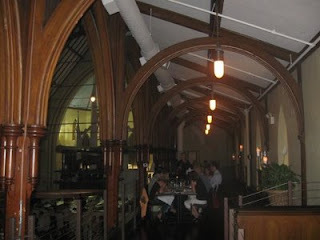 Portland's Newest Eatery: Grace is the Word! By the crowd on a Thursday evening one would be hard pressed to believe that Grace - Portland’s newest eat ‘n drinkery - had been open for barely a week. There has been so much buzz about the place, its opening delayed by months, expectations running high and concerns even higher what, with the current economic crunch paralyzing a town that has seen closings of restaurants, bars, and shops of every stripe, but I’m here to tell you: Grace is a gem. 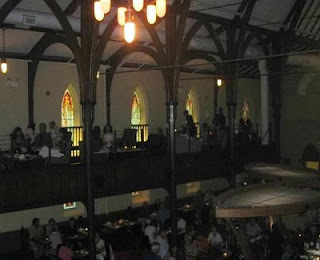 Housed in the former Chestnut Street Methodist Church, the proprietors of Grace’s made the wise decision to keep as much of the striking ornate neo-gothic features as possible and creatively and brilliantly salvaged sections that needed to be struck and incorporated them into features that make any visit here feel like a special occasion. One of the most impressive features of Grace is its staff; knowledgeable, energetic, eager and seeming –down to a one – to love their jobs it is an enormous relief to discover there are no ennui-ridden 23 year olds screwing up the orders and wearing that “I wish I were anywhere but here waiting on you” face, too typical in this town. Even in a decent crowd they glide past with a nearly invisible effortlessness and a sense of . . . well, grace. We were not there for dinner, though the menu looks appealing and priced well enough to make it a place for not only special occasions, but just a nice night out. A separate bar menu offers nice spins on standard pub fare, with a lobster taco that looks might good. 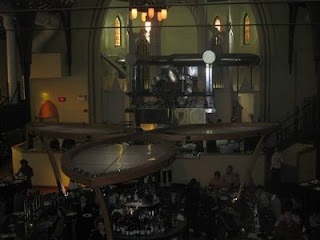 A decent tap selection of beers (including a favorite of mine: Rogue’s Dead Guy Ale), an impressive and affordable wine list and a creative drink menu with truly original spins on classic cocktails make this a drinking paradise . . . the kind of church a guy could become a regular at! The ornate architectural features of the church blend in beautifully and lend a sense of elegance and comfort. The massive vaulted ceilings help and an impressive ventilation system keep the heat moving up (an important element since the open kitchen generates plenty of that) . Another major plus is that, even while pleasantly crowded with people drinking and dining the noise level is minimal with no need for screamed conversations. 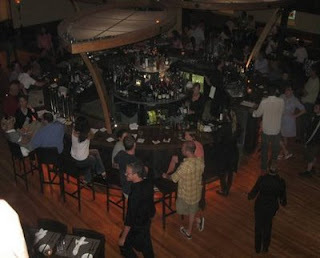 And finally we have a bar where one is not subjected to anyone else’s taste in music. 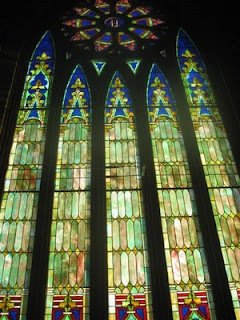 The stained glass keeps plenty of light streaming in, but the leaded glass also means the light is diffused and softer. When the sun is “just right” the great one in the front (back, actually) its rose window sitting atop the arches of sumptuous colors produces jaw dropping effects. Don’t trust me . . . see for yourself. The location, tucked away on Chestnut Street and next door to City Hall, the blending of architectural styles of City Hall, Portland High School and the Back Bay creates an impressive study in urban contrasts. There have been naysayers about that location, lack of parking, etc., but there is an energy – even very early on – that feels palpable and that we are going to be enjoying– and talking about this place for years to come.